During the last Ice Age, 18,000 years ago, much of Britain was covered in a thick blanket of snow and ice and the north-east of England was an uninhabitable freezing wasteland. However, as the glaciers melted, human settlers began to move into these unoccupied areas. The landscape would have been cold and icy with few trees. Despite this there was enough food for the herds of reindeer and elk which lived there. The first groups of settlers would have survived mainly by hunting these wild animals and gathering the few edible plants. It took a long while for the first early settlers to make their mark. There are only a few slight archaeological remains belonging to this Palaeolithic period. A simple flint tool has been found in the Tyne Valley at Eltringham and a small group of similar objects have been found in Teesdale. Although the Mesolithic inhabitants of the north-east were not farmers, they changed the environment. Environmental surveys have recorded many microscopic fragments of charcoal, which suggests that people were setting fire to areas of forest. This had several purposes, including encouraging new plant growth on which deer and other animals could feed. Despite the good evidence for what people ate and where they lived, we know very little about their inner thoughts. There are no burials at all from this period in the north-east of England, nor are there any religious sites. However, we know from other areas of Britain that some of the dead may have been buried in caves. It is thought that these societies believed in spirits related to the animals and land around them, and may have treated natural sites, such as woods, springs and boulders as holy sites. From around 4000BC there were slow changes in life in North East England. As well as hunting and gathering it appears that people began to plant crops and to domesticate animals. It took a long time for these early farming techniques to become the main source of food, and the sea in particular remained a vital source of nourishment. This slow growth of farming led to forests being cleared more permanently to allow animals to graze and crops to be planted. Little is known about the settlements of the Neolithic period. Few sites have been recognised, though the base of possible huts have been found at Belsay. As in the earlier period, many people may have continued to live in different places during the year, perhaps leading their herds up to higher ground during the summer and coming down from the hills when the cold winter months arrived. It is possible that some later settlements of Bronze Age date may have been built over earlier Neolithic houses. Tools continued to be mainly made of flint and other rocks, though their shape changed. Neolithic tools were larger than the small Mesolithic microliths. Stone axes appear to have been particularly important. As well as having a practical use for clearing forests they may also have had had a religious purpose. In some areas, such as near Felton and Chollerton (Northumberland), where many such axes have been found, they may have been deliberately buried as presents for the gods. These axes were often made from stone from distant places, and were clearly greatly valued by their owners. The importance of such objects is just one indication of the increasing time spent by Neolithic society on ritual activity. Unlike the Mesolithic period, several burial sites survive. Although Neolithic houses may have been small and simple, the stone mounds in which they buried their dead were large in size and some contained complex stone chambers in which the bodies were placed. These were not simply cemeteries, but probably had other religious purposes and seem to have been used to show the power and importance of the group who built them. A number of different types of enclosure seem to have been used as religious sites. Stone circles and the closely related henges are found throughout the orth-east of England, and the larger causewayed enclosure are also known, though are thought to be earlier in date. 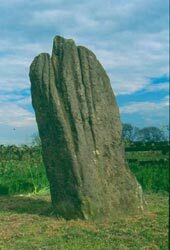 Such Neolithic monuments were often placed in large groups, forming entire landscapes of religious sites, such as the henges of Milfield Basin in Northumberland. Although many of these religious sites were manmade, it is probable that natural places also continued to be important. Manmade monuments were often placed close to major trackways used by wild animals as well as people, or at sites with wide views where they could be seen from long distances. In the late Neolithic and Bronze Age there was a period of sudden change. New types of pottery were introduced, similar to pottery found elsewhere in England and on the Continent. This pottery was often used to contain the burnt remains of cremations, which increasingly became an important way of burying the dead. These burials were frequently placed in round barrows of earth or stone. For the first time bronze tools began to be used. Many archaeologists have called these new developments, the Beaker Culture, on account of the shape of some of the new pots. It was long thought that this was an sign that new groups of people, probably from Europe, were beginning to settle in the north-east. However, many archaeologists now believe that it was just the styles and ideas that spread, not the people. In the late Neolithic and early Bronze Age farming became increasingly important. Although bronze tools were used experiments have shown that flint and stone axes are better or felling large trees. The evidence from prehistoric pollen shows that woods were disappearing and that grassland and moorland was increasing, and new crops were introduced. In upland areas the land also had to be cleared of large stones to allow ploughing. The remains of many of the stone cairns made from the cleared stone can be seen in the Cheviots and the North Pennines. For the first time the boundaries of fields, probably also made from cleared stone, can be seen. These fields often surrounded small settlements made up of groups of round huts. In many upland areas the circular stone foundations of these huts can still be seen. These agricultural remains were not the only alteration of the landscape. Carvings were made on rock outcrops, as well as boulders and some smaller, portable stones. These carvings are usually known as cup and ring marks. Cup marks were simple hollows chipped into the rock and were sometimes surrounded by one or more circular ring marks. Other patterns included channels or grooves linking cups and rings and occasional spiral shapes. The precise purpose of these carvings is unknown, though many suggestions have been made and they probably had a religious or ritual meaning. They are often found in upland areas overlooking agricultural land, and some are known close to important natural routeways. This type of rock art is thought to be mainly of Neolithic date. Later carvings were sometimes carved in other locations. For example, several are carved on the cover of a stone-lined grave found at Witton Gilbert. At Lordenshaws burial cairns may have been built over the earlier carvings. However, it is possible that these rocks may have been moved from somewhere else. The large number of earlier religious monuments began to go out of use during the Bronze Age. Rather than placing the dead in elaborate long-barrows, the inhabitants of the North East England usually placed the remains in simpler stone or earth mounds. Although many of these were quite small and not very spectacular, some were very big, and could have been seen from a great distance. Little is known about religious beliefs, but the placement of hoards of objects in special places became more common. A large collection of bronze rings, pins, spearheads, swords and other objects were found in a cave at Heathery Burn. Other important hoards have been found at Gilmonby, Eastgate and Denwick. Iron tools began to replace bronze tools from around 1000BC, though they did not become common until about 500BC. As metal tools became more popular, tools made from worked flint fell out of use. Despite these changes, many other aspects of life remained remarkably similar to earlier times. People continued to grow crops and farm cattle and sheep; near the coast seafood was probably also an important part of the daily diet. They also still used the same kind of simple circular house. In lowland areas these would probably have had walls made from wood and wattle and daub, but in the uplands the walls were made from turf and stone. The remains of many of these stone huts of Bronze Age and Iron Age date can still be seen in many areas of upland Northumberland and Durham, particularly in the North Cheviots. Although there were few changes in the design of houses, there were some differences in the plan of the settlements. In the Bronze Age the huts that were unenclosed, but in the Iron Age many settlements had earth banks and ditches built round them. Wooden palisades also surrounded many farmsteads. In some areas the enclosures can still be seen, but elsewhere they have been destroyed by later farming and can only be seen during archaeological excavations or as cropmarks. There are many possible reasons why these defences may have been built. It may have been that society was becoming increasingly violent, and that there was a need for people to protect themselves. Another possibility is that they were built by people to show others how important they were, and to mark themselves out from their neighbours. As well as these small settlements, in the late Bronze Age and Iron Age larger sites began to develop. They were often sited on hilltops, and like the smaller villages these were often defended. The earlier settlements only had a single bank or ditch, but the later Iron Age hillforts often had several rows of ramparts. The purpose of these sites is unclear. Some archaeologists have suggested that they were where important chiefs lived, and that they were a bit like Medieval castles. Others have suggested that they were used as centres for local tribes, who may have come together at certain times of year to exchange animals, foods and other products, and perhaps take part in religious ceremonies. Some of these hillforts were very big - over 130 huts have been recorded at Yeavering Bell. There are some differences across the region. There are more hillforts in Northumberland and the defences built around even small settlements are much more impressive than those found in County Durham. Burial practices in this period are relatively scarce, Iron Age people disposed of their dead in archaeological invisible ways. There is very little evidence for the cremation and burial of Iron Age people in barrows, with the only example from Northumberland being a few pieces of burnt bone associated with a single iron ring headed pin at High Knowes, Alnham, (Northumberland). In Durham there is a cave burial at Bishop Middleham, which had six individuals buried there with pottery that dates from the late bronze age and early iron age. There are also examples of cave burials in Yorkshire. We know from Roman writers that at the end of the Iron Age most of the north-east was ruled by just two tribes. To the north were the Votadini whose land stretched as far north as Edinburgh. South of them were the lands of the Brigantes, who probably ruled as far south as the southern edge of the North York Moors. These main tribes were probably made up of groups of smaller tribes, and it is possible that they sometimes came into conflict. However, when the Roman armies arrived in the mid-first century AD they had to turn their attentions to a more powerful enemy.